to help you add, edit and remove keywords at scale. Today, we are happy to announce bulk uploads for ads and ad groups. After making your changes, you can save your changes in CSV, TSV and Excel formats. 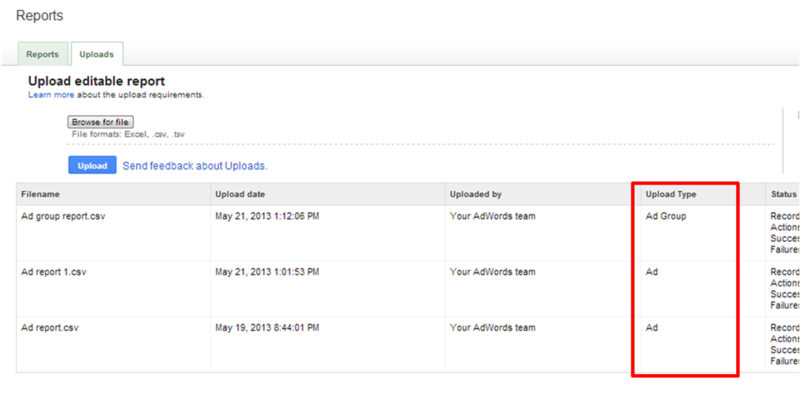 To upload this file, click “Reports and uploads” on the left navigation panel, and then select the “Uploads” tab. You will see a new column here titled “Upload type,” shown below. You can only upload one report type at a time; for example, if you want to make bulk changes to both your keywords and your ad creatives, you would have to do this by editing and uploading two separate reports. As with keyword bulk uploads, there is no way to cancel or automatically reverse your changes once a report has been submitted. Please remember to save a copy of your original downloaded report if you need to know what your settings were before you made changes and submitted a bulk upload. You can also view your change history and reverse any unintended changes manually. To learn more about bulk uploads for ads and ad groups, visit the bulk uploads article in our Help Center or discuss in our AdWords Community. The ability to make changes to your AdWords account in bulk enables you to spend more time optimizing your campaigns to grow your business, and less time on repetitive tasks. Just last month, we launched keyword bulk uploads to help you add, edit and remove keywords at scale. Today, we are happy to announce bulk uploads for ads and ad groups.